With only 3 weeks to go until Flash on the Beach I just received some great news. The conference is almost sold out! They only have 80 tickets left, so if you haven’t bought yours yet, you better hurry as they are going fast. 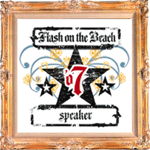 It looks like this years Flash on the Beach is going to be awesome. I can’t wait to be honest, plus with MAX in Barcelona next week. Autumn is shaping up to be very cool indeed.